This brand new villa constructed in 2014 will seduce you with its minimalist architecture framed in a beautiful tropical style. The single story 2 Are Villa is set on 5 are of land. The moment you enter the door you will discover the beauty and simplicity of the villa; its pool house, its infinity pool and integrated pool bar, its open living and dinning room, its cascading plants and exotic palm trees in the garden, and its lagoon-like fish ponds between each charming bedroom. Paradise is what you will experience during your stay here. Spoil yourself and enjoy a private Jacuzzi in a tropical atmosphere at any time of the day or night. Admire the beautiful Balinese sunset from the terrace, the garden or even from the pool while enjoying a tropical cocktail at the pool bar. indulge yourself by using the fully equipped American kitchen or the open-air barbecue to create unforgettable meals. 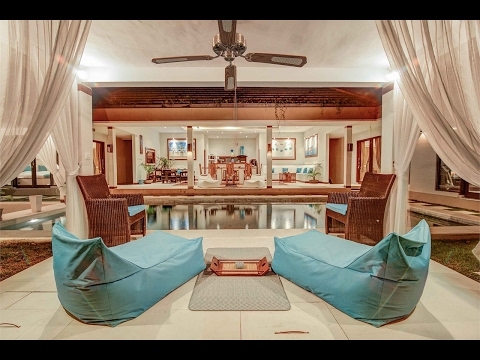 The Villa is located just a stones throw away from Seminyak but still retains a traditional Balinese village surroundings. You can enjoy the traditional markets, small Balinese street food shops, Hindu temples or traditional handy craft suppliers who will surprise you with their kindness and hospitality. You will also enjoy being close to Seminyak or Legian beach, where you will either surf the huge waves, work on your tan or appreciate a nice cocktail on the poolside of the may beach clubs in the area. You will end up admiring the brave surfers of Kuta Beach or simply delight yourself while watching the legendary Balinese Sunset. Leasehold until June 1 ,2036, with an option to extend.